A homemaking binder is a great help for busy homemakers. Here are some ideas for creating your own or buying one that’s already done for you. I love using a home management binder because it’s an easy way to stay organized. It’s a central place to keep all of those important papers and ideas (things like schedules, menus, and cleaning routines). 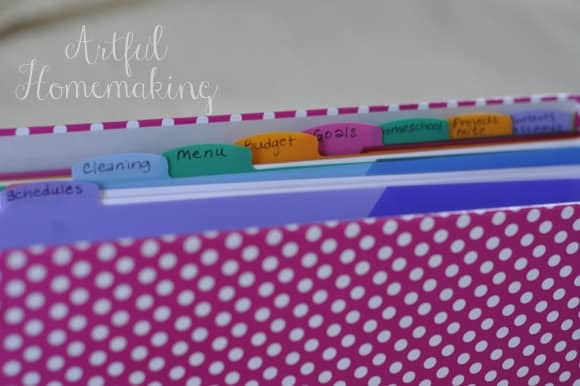 I’ve written about my homemaking binder before (you can read all about my binder and see inside it here), and one of the questions I’ve been asked is how to create all the forms I use inside. When I was setting up my homemaking binder, I could never find exactly what I was looking for, so I just made my own that were tailored to fit our own home and family. You can include so many things inside your homemaking binder, but I prefer to keep mine fairly simple. I created a menu-planning sheet (get the free printable menu planning form here), and I made many of the other forms inside my planner. 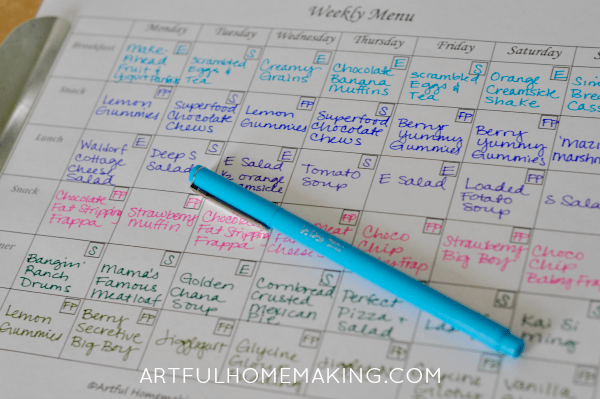 There are also lots of free printable homemaking planner forms available online. If creating your own home management binder seems too difficult or time-consuming, you might be interested in this ready-made homemaking binder. Everything comes pre-printed and ready to go! It’s The Simplified Home Base Binder from Emily Ley (creator of The Simplified Planner). I love Emily’s products. Her planners are beautiful and very high-quality (check out my review of her Simplified Planner here). I love that this kit comes with everything you need to put together a complete binder. You get a beautiful, durable 3-ring binder, 6 colorful dividers, and 82 planning sheets. Joy – you have such pretty handwrite and it fits so nice in those little boxes.. I write so big, I would need double the size boxes… that and my eyesight isn’t what it used to be. Oh and you are super organized! I used to be, or so I thought… maybe I was just kidding myself, because, I am but not so much anymore LOL we are neighbors at #LiveLifeWell today – this is the second post of yours I got to read and I just love your stuff. Your homemaking binder shows that it was well thought out when you created it. I have a binder with similar sections, but I have my budgeting in a separate binder. Ideally, I would have it all together, but my homemaking binder ended up to be bigger once I added in my Christmas list and contact list. Thanks for sharing this great idea at Booknificent Thursday on Mommynificent.com! I have a recipe, and meal planning binder but, love this idea. Pinned and sharing. Thanks for sharing at the inspiration spotlight party @DearCreatives See you again soon. I love home organization and I can’t believe I haven’t thought of putting it all in a binder. I could add in my commonly used recipes as well. Emily Ley products are beautiful. Yes, recipes are great in the binder also! 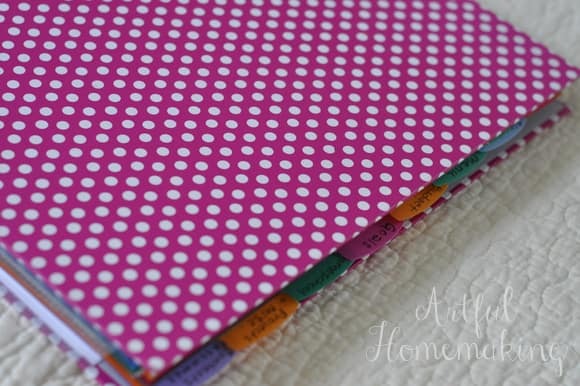 I love the idea of a homemaking binder. I keep both the cleaning schedule and the menu plan (and grocery list) on our fridge. I love the idea of keeping them better organized like in a binder but am so afraid that if they’re not in sight I might forget to use them. I’ll have to give it a try. Pinned. So glad it was inspiring, Carri! Thanks for visiting today! This is such a great resource! Thank you so much for sharing this and for linking up @LiveLifeWell!! I know, aren't they lovely! Thanks so much for stopping by, JES! Really nice forms. I do a daily docket every day and that is my favorite. I agree about the daily docket—so helpful!